Today we celebrate the life of the man I wrote about in my spiritual memoir, Loves God, Likes Girls. I’ll forever be grateful for the ways God used David Lewis in my life. Wondering how to respond with the love of Jesus to someone who tells you she’s gay? Read on…. “I called and made an appointment with the counselor I’d gone to during the last year of teaching high school about my relationship with my father. The counselor who had absolutely no idea what I’d been keeping from him. I had chosen the counselor carefully. He had worked on some research and writing projects with my favorite professor from college. I knew he had the credentials in psychology, he was a Christian, and my favorite professor trusted him. I thought maybe I could trust him, too. But I didn’t know how he would react. He might react with the same facial expressions I had seen on preachers’ faces from the pulpit, looks of disgust, as though they couldn’t stand the thought of being near someone “like that.” He might not want to deal with me and refer me to someone else. I had to take the chance. I had to tell someone. On a bitter cold, snowy day, with ice on the roads and a small voice telling me to run the car off the side of the road and no one would be the wiser, I drove three hours to his office in north Dallas. My heart pounded as I approached the door, praying I wouldn’t see anyone I knew as I walked into the waiting room. As I pushed open the door and entered the waiting room, the first person I saw was a guy I had gone to college with and hadn’t seen in fifteen years. He looked up from the magazine he was reading and smiled. Then looked away, probably as embarrassed at being seen there as I was. Then I turned to the receptionist and couldn’t believe it. There sat the former youth minister’s wife from my home church twenty-five years before, the woman who had stood with me as I dried off after my baptism saying over and over, “Oh, sweet girl. Oh, sweet girl.” Just as she greeted me, her husband, now one of the psychologists in the office, walked in. I was scared half to death. These people had known and loved me since I was a little girl. Would they still love me if they knew? My paranoia also told me I had a label that instantly exposed me to everyone in the room. As though, like Hester Prynne’s scarlet letter “A,” I wore an “H” for homosexual emblazoned on my chest. If anyone found out that I was seeking a counselor to talk about an attraction to my own gender, oh my. What would they think? I remember a lot of things about that day—the day I first told someone I liked girls. I remember the office we were in and where I was sitting. I remember what I was wearing. But I don’t remember what he said to me in response to my declaration. In fact, I don’t think he said much of anything. Mostly he just listened. The expression on his face never changed. His countenance never grew cold or resistant. He remained warm and inviting, as though nothing I said shocked him. As though he felt no revulsion toward me at all. Scary as it was, I felt a great sense of freedom in finally telling someone. Nothing instantly changed inside me. I still had no idea what to do with all those feelings. But at least now it wasn’t my own secret. We talked for a couple of hours that morning, and not only did he not walk away, he invited me to come back for a couple more hours that afternoon. Although I was relieved to be welcomed back, I couldn’t help but wonder if that meant that I was really screwed up! But no more than all the rest of us. That happened over sixteen years ago and since that time I’ve had the opportunity to share that secret of mine with thousands of people all over the world. I wouldn’t have had the courage to do that if I hadn’t found a safe place to pour my heart out that very first time. What would’ve happened if he had not responded so warmly? What if the gentle smile and the kindness of his eyes had been replaced by a wrinkled brow and no smile? Or worse yet, what if he hadn’t looked at me at all? 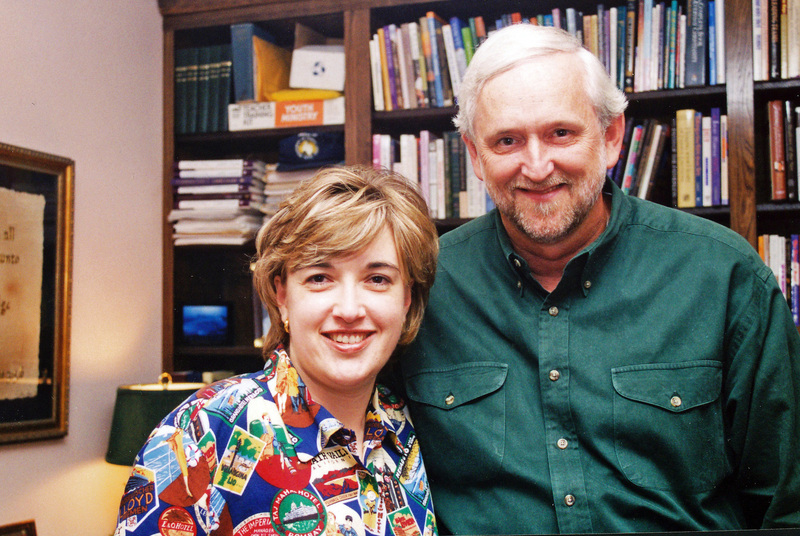 David Lewis & Sally Gary in David’s office at Lake Highlands Church, 1999. I don’t think he knew all the answers at that moment. But what he did know is that having all the answers as to how to “fix” me wasn’t what I needed. He knew it was more important to listen. If nothing else, to be willing to absorb some of the agonizing pain of carrying an unbearable secret for most of my life. Most importantly, he knew Jesus. He knew how to look at me through the eyes of Christ, to listen with the Good Shepherd’s heart of compassion, and to extend the same hospitality to me that he himself had received. Never once did he tell me what he thought about homosexuality. Never once did he quote Scripture to me in that first meeting. In the weeks and months and years ahead, we never ever looked at the passages in Genesis or Leviticus or Romans or 1 Corinthians or 1 Timothy. Because I knew they were there. And he was wise enough to meet me where I hurt, just as Jesus did for all those he encountered. When I left the office that day I didn’t have any answers. He didn’t give me any assignments. I wasn’t given any books to read. In a way it would’ve been nice to have those things, because that was the way part of me has been wired—to think my way out of difficulties, to find a rational, academic solution to the problem, to critically analyze and outline the answer to the question. But that wasn’t what I needed right then—if ever.